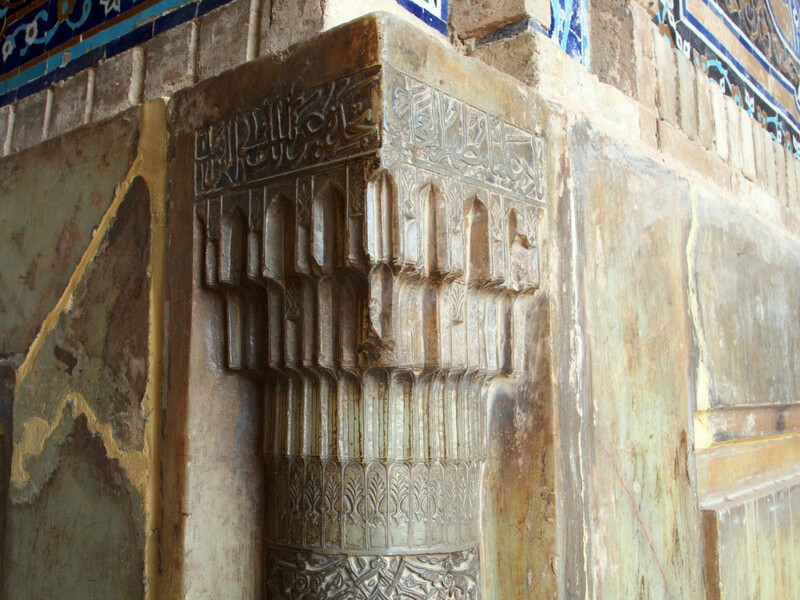 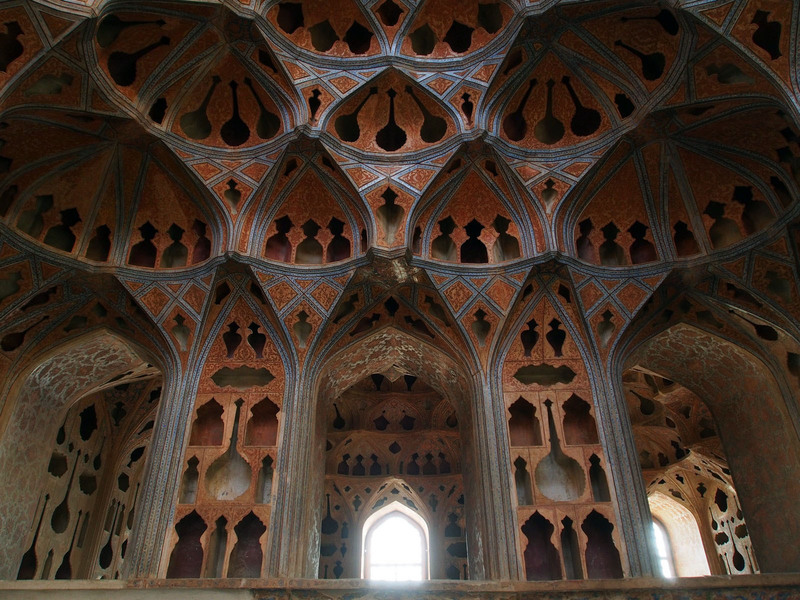 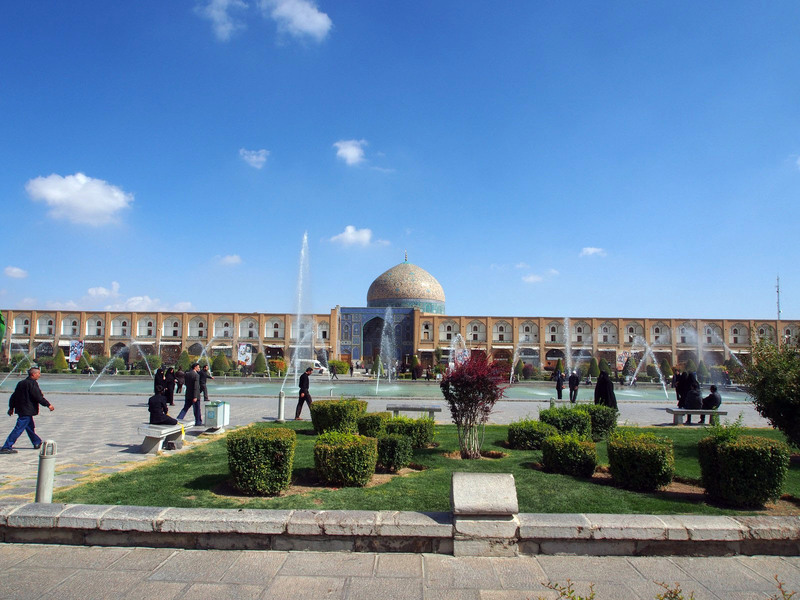 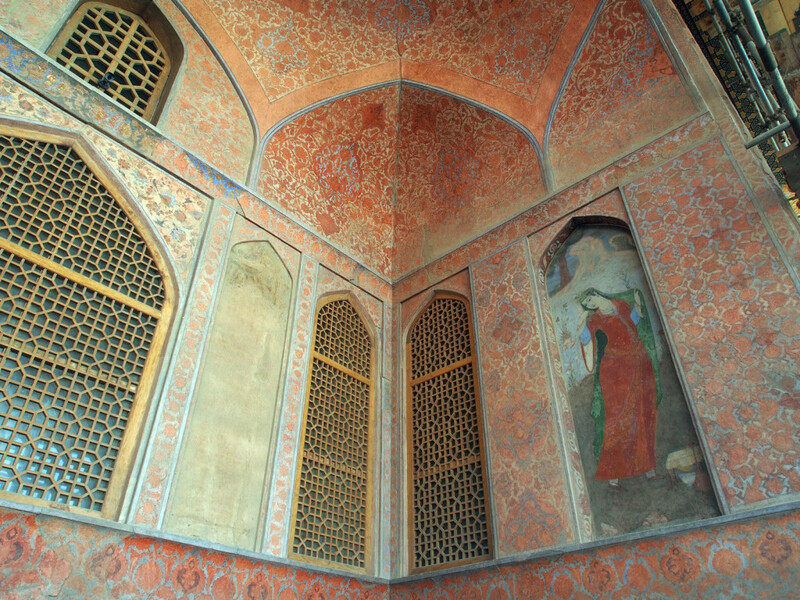 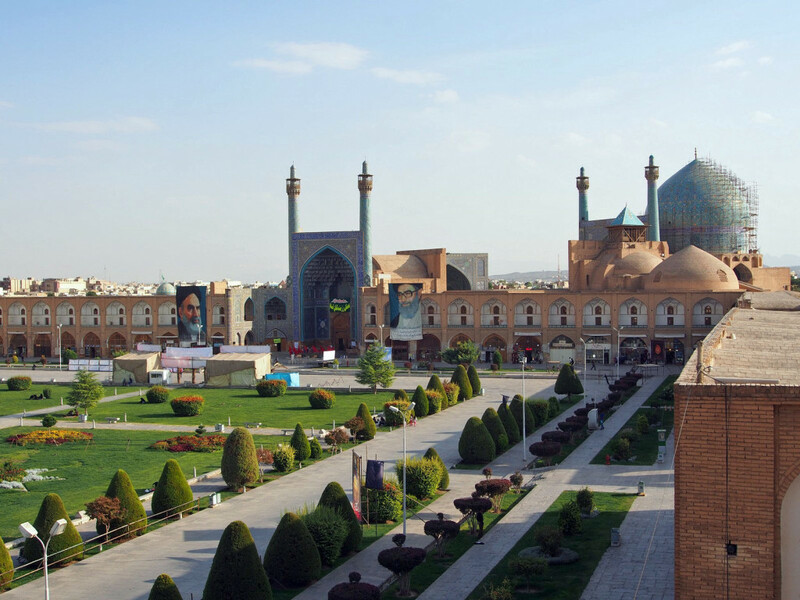 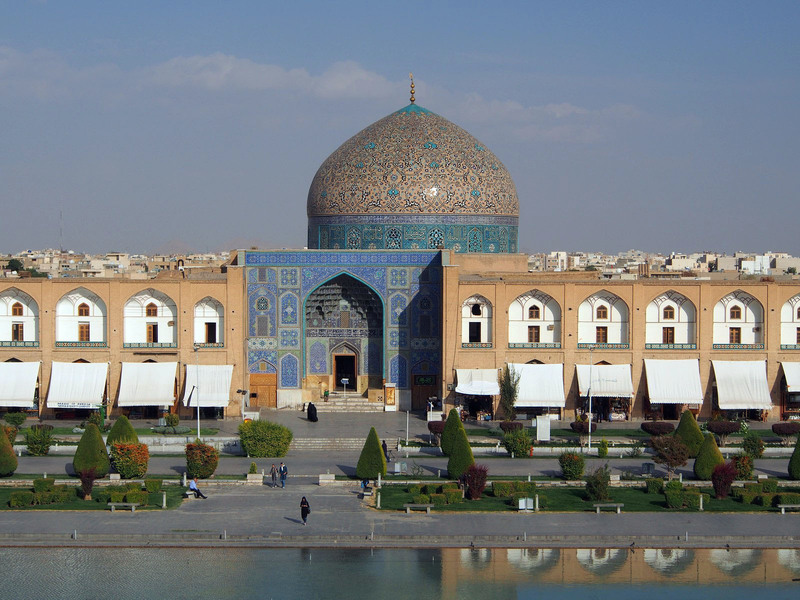 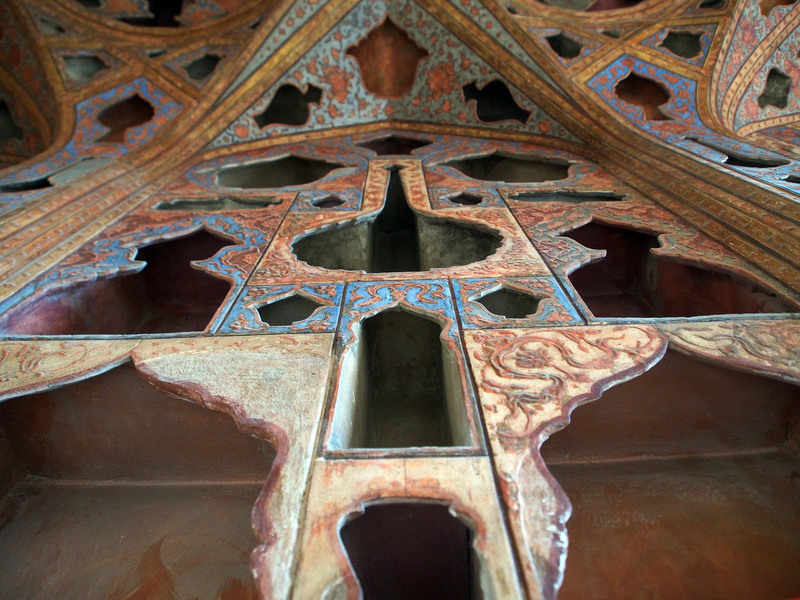 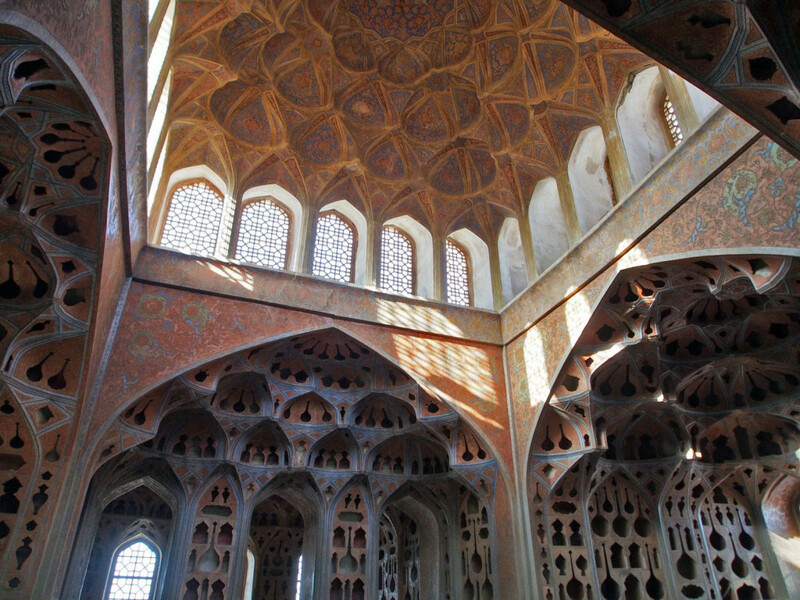 Isfahan is Iran’s third largest city, and has one of the longest and most complex histories – acting as the capital of Persia during two separate periods. 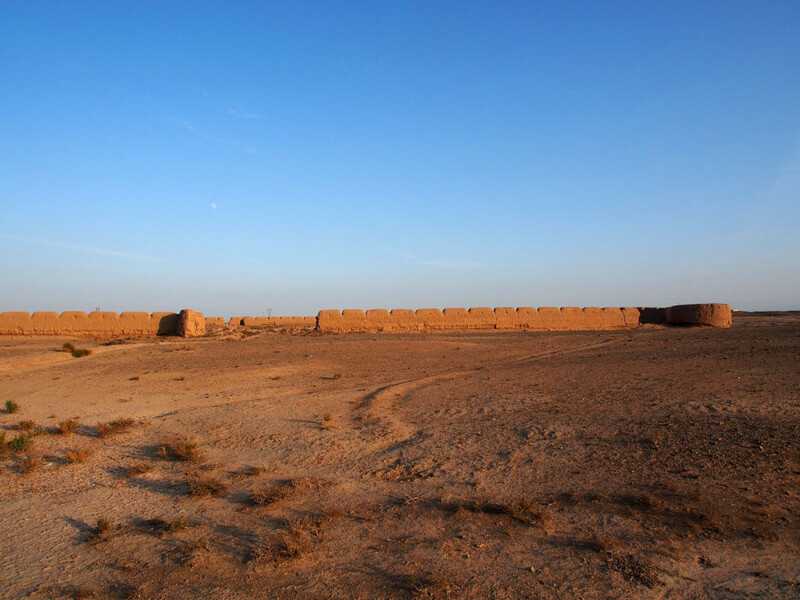 Over three millennia, the city’s fortunes have waxed and waned under dozens of empires and conquerors. 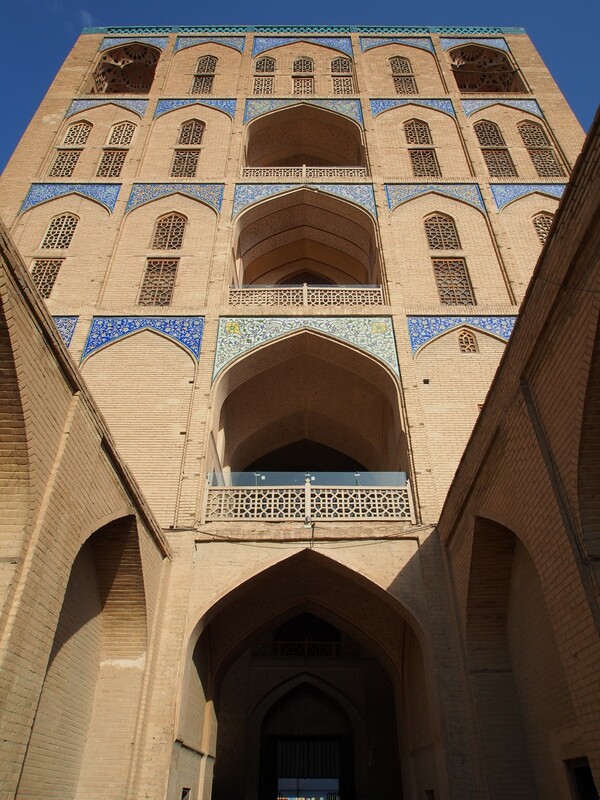 Despite this, however, most of the architecture and cityscape date from the 16th Century onwards, but similarly to Yazd, there’s a palpable sensation of history, when wandering through the meandering streets. 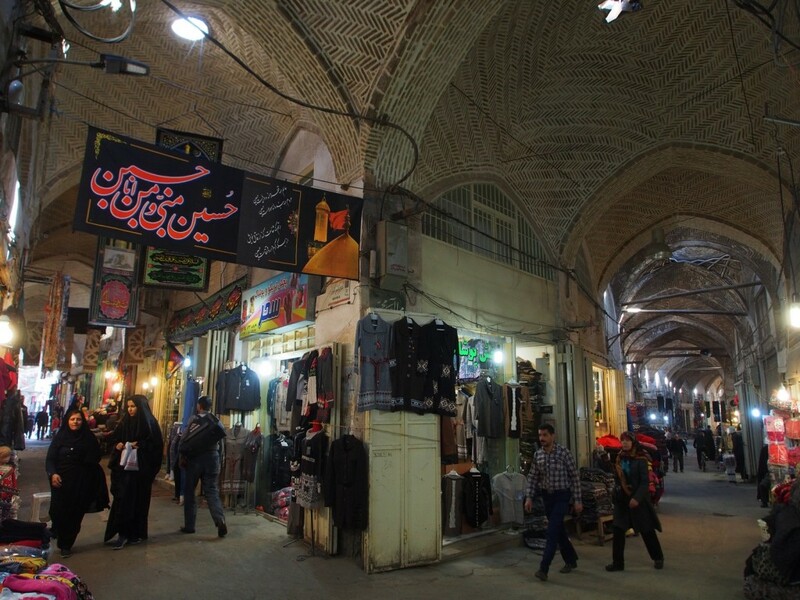 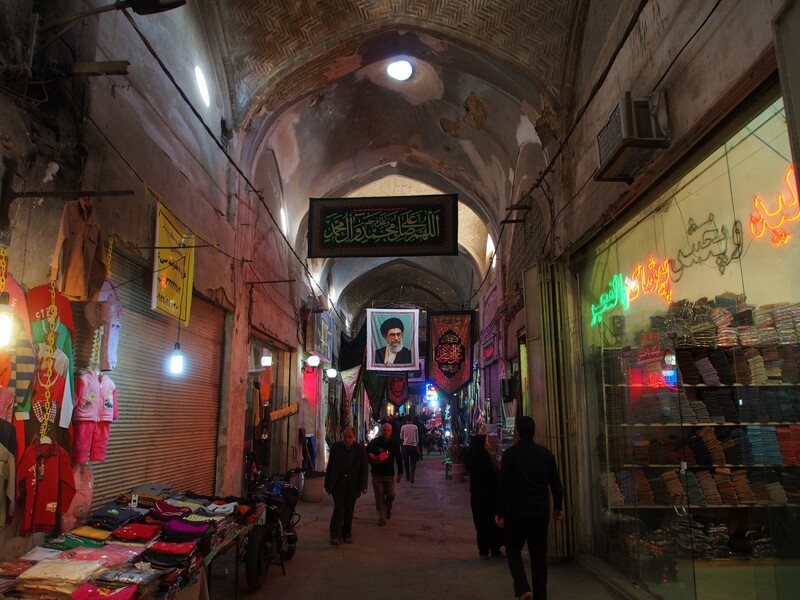 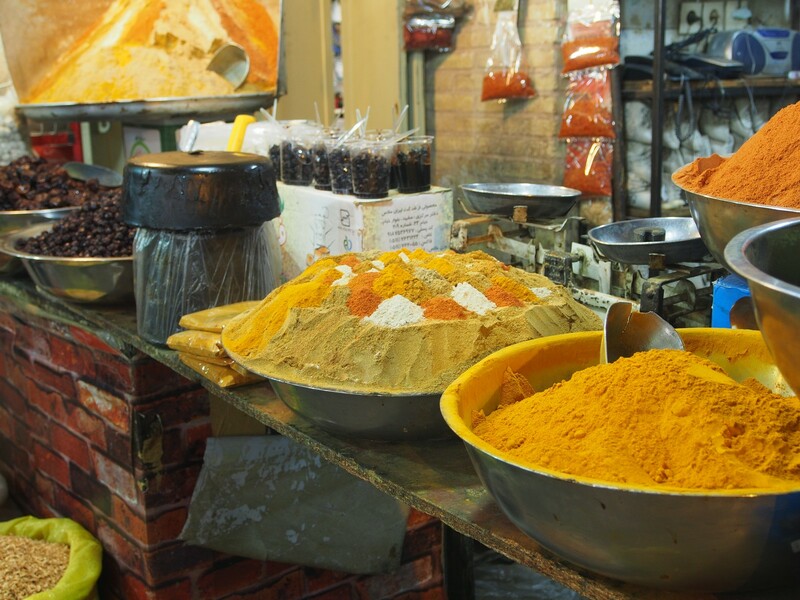 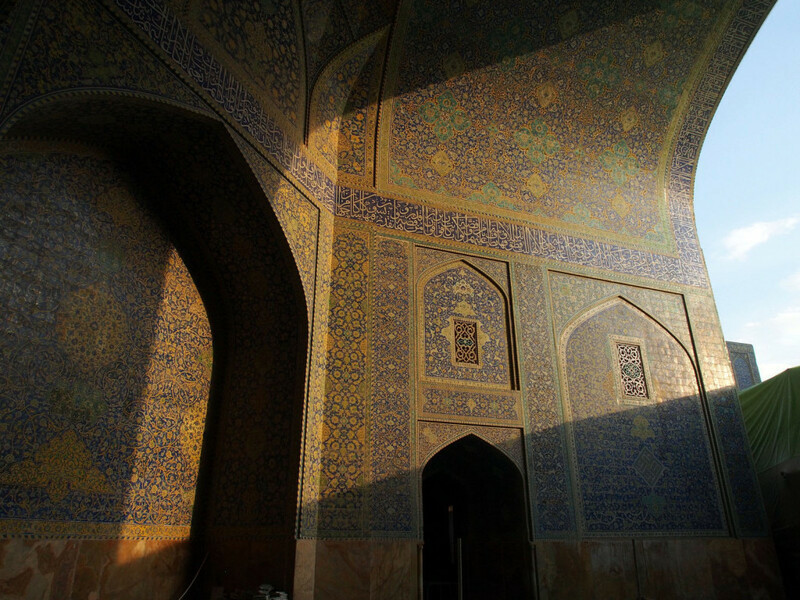 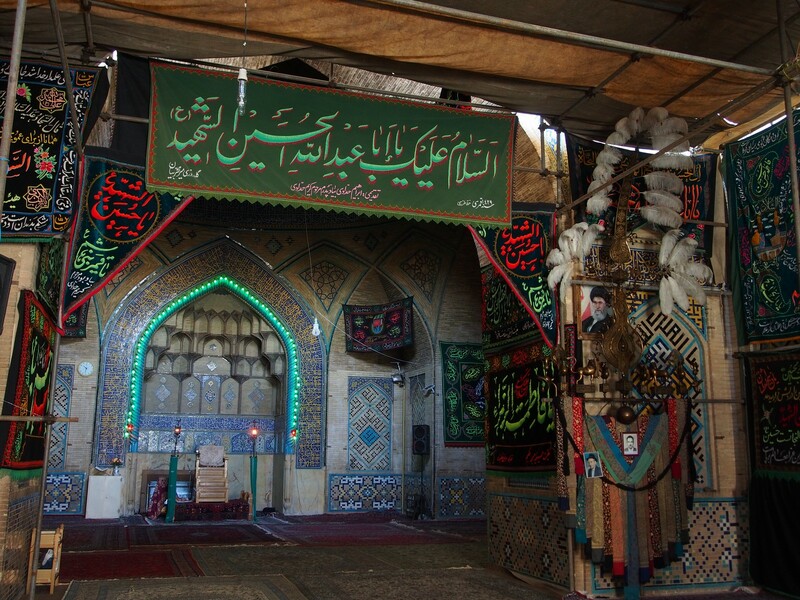 A walk in and around the monuments of Isfahan means traipsing around the back alleys and covered pedestrian bazaars. 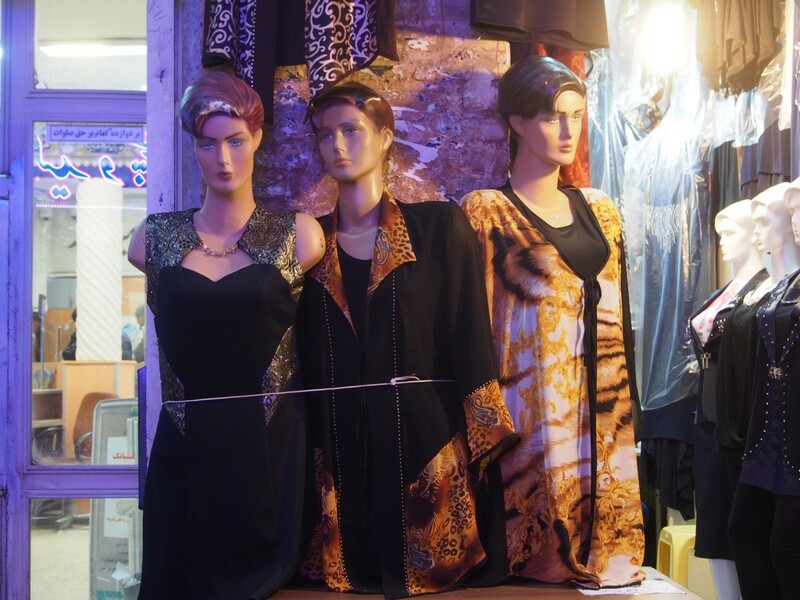 One interesting aspect is the female fashion on display (including some very racy lingerie) – very liberal considering that more than 70% of women here wear the ‘chador’, literally a tent that leaves only the face uncovered. 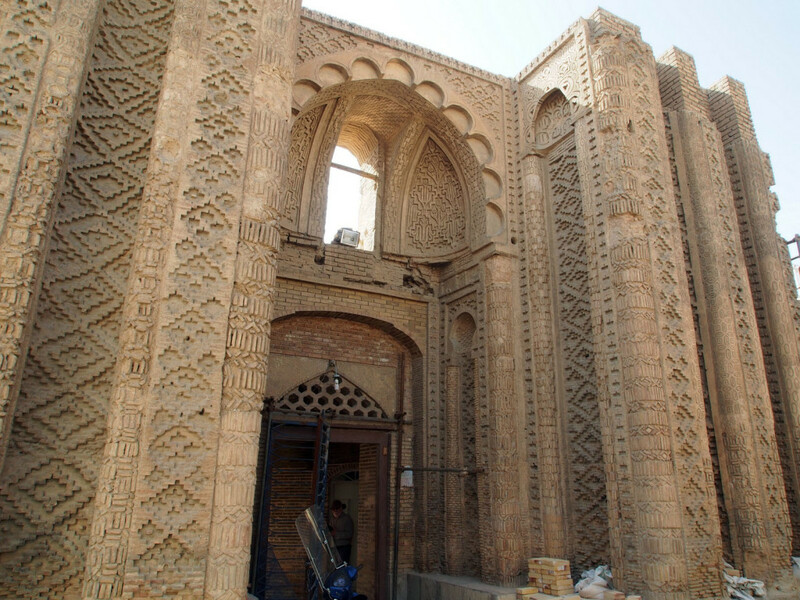 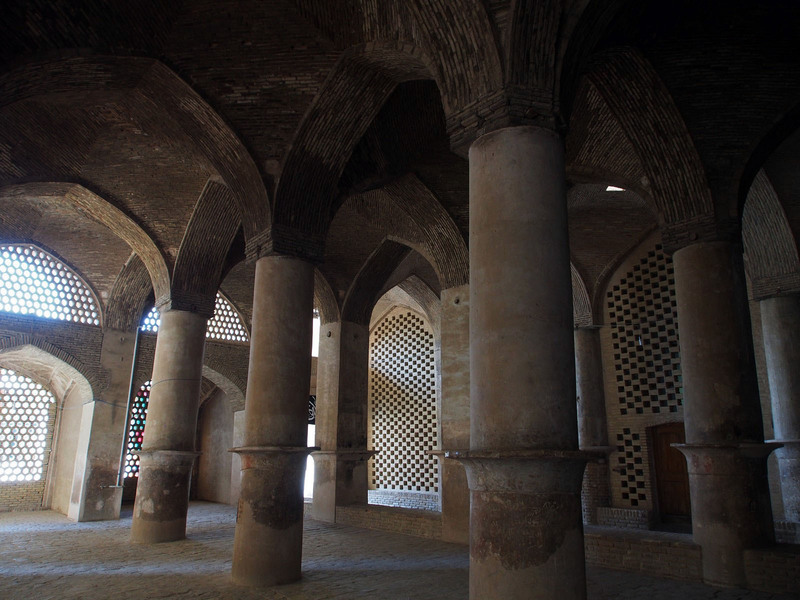 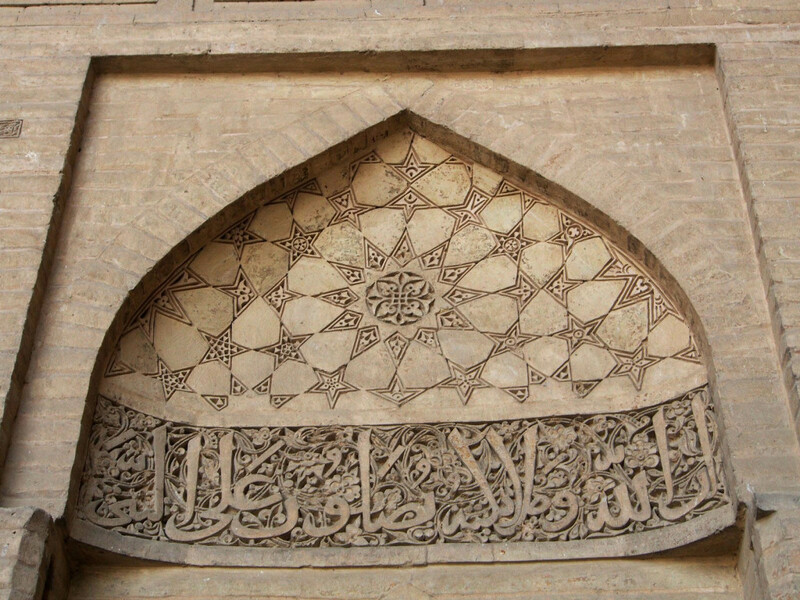 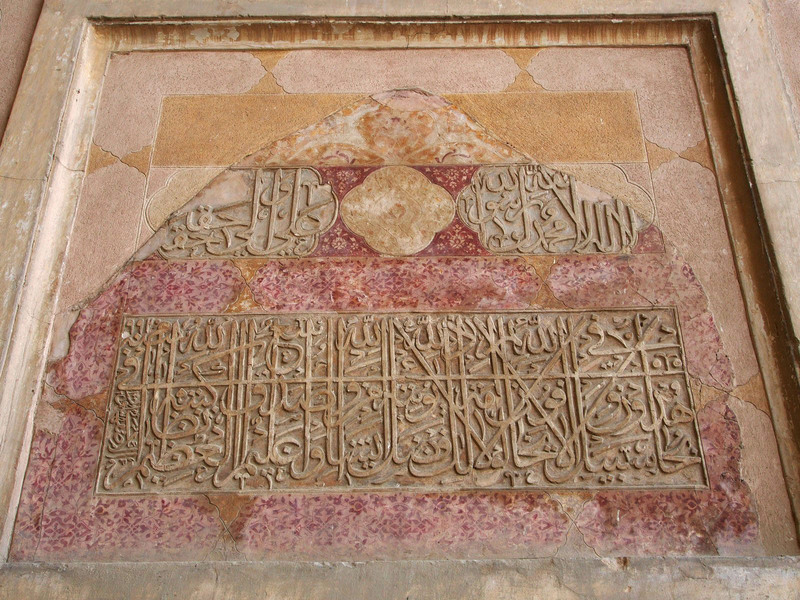 The Hakim Mosque is the oldest in the city, although the only remaining part dating back to the original 11th Century construction is one gateway – the geometric arrangement of the bricks lending a texture and pattern without the use of colours mosaics. 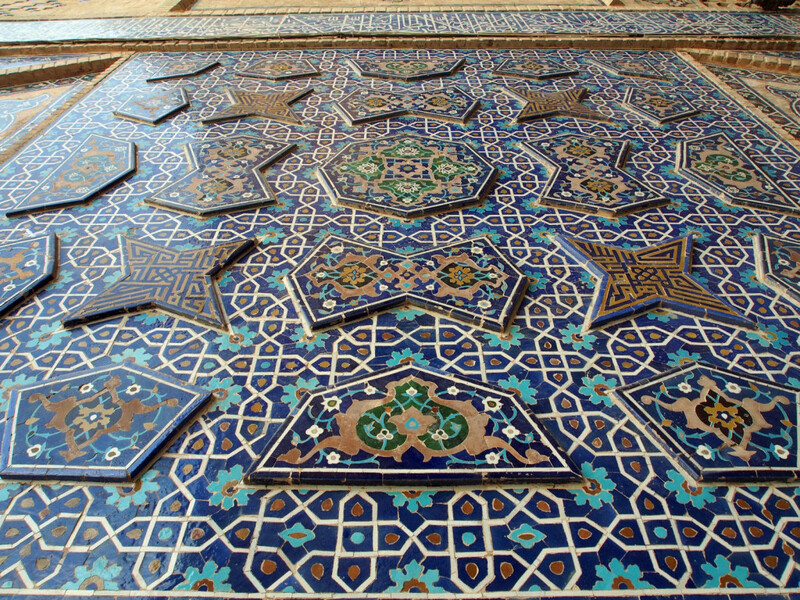 The remainder is more conventional in style. 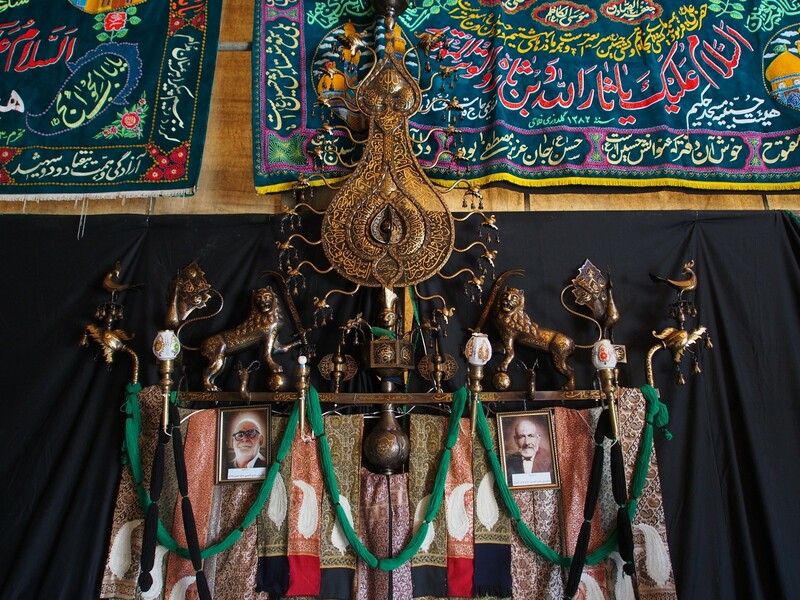 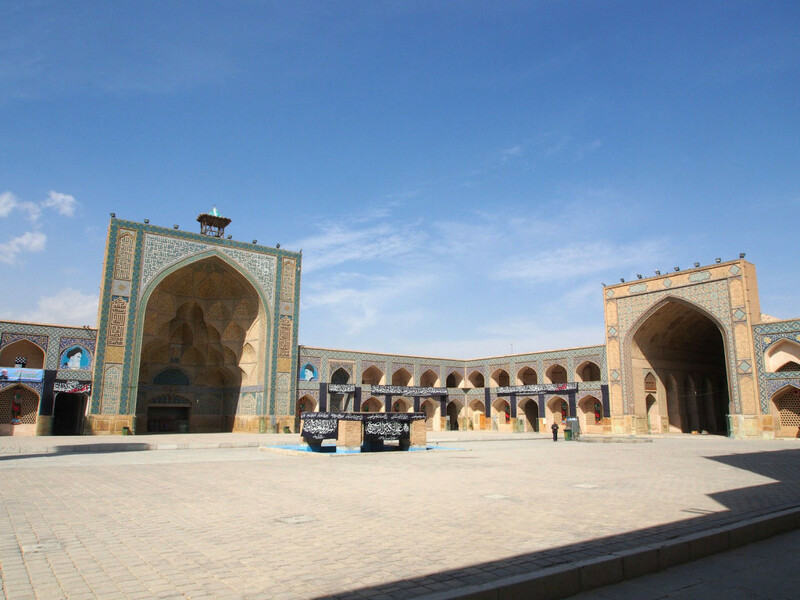 Our visit to Isfahan coincided with the Islamic month of Muharram, during which Shia Muslims mourn the death of Husayn ibn Ali, Mohammed’s grandson. 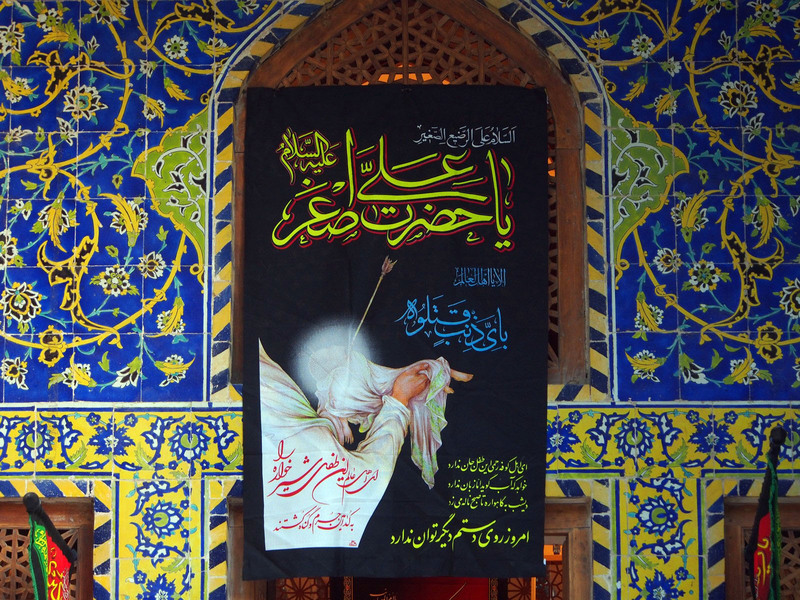 Everywhere were banners mourning his death, and religious paraphernalia. 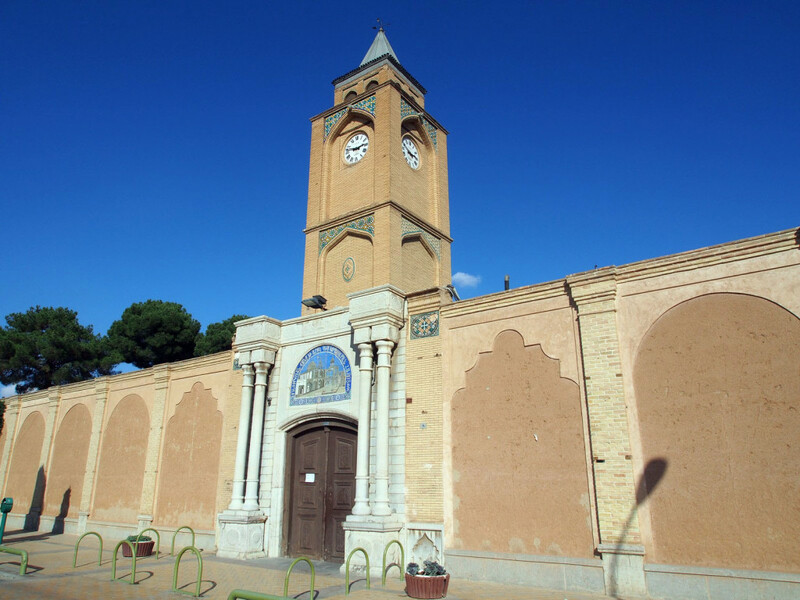 Songs of mourning were played in the streets every night until midnight, and there were even flagellation ceremonies (whipping oneself with chains to symbolize the willingness to have one’s blood spilt with the fallen). 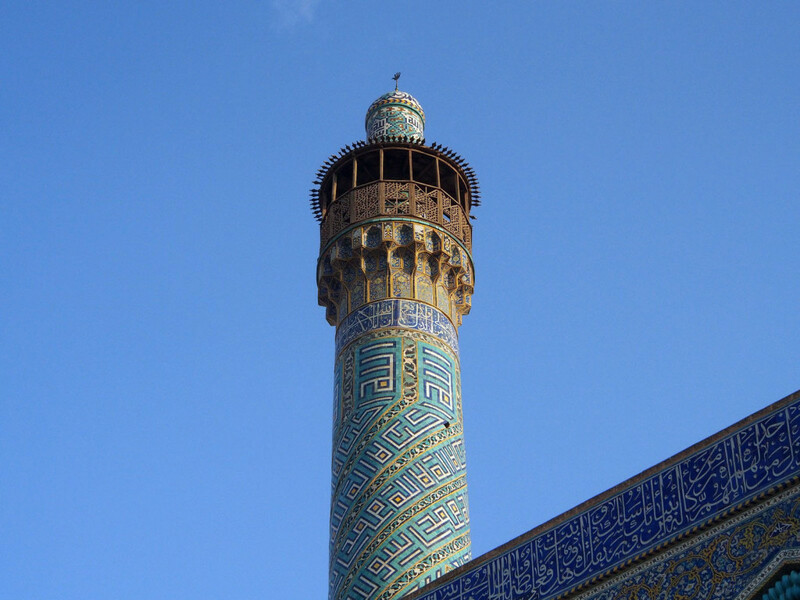 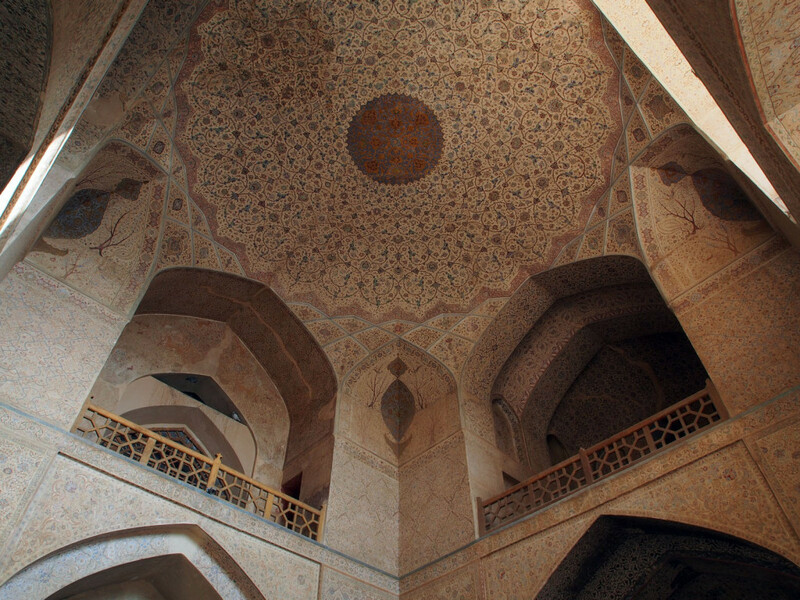 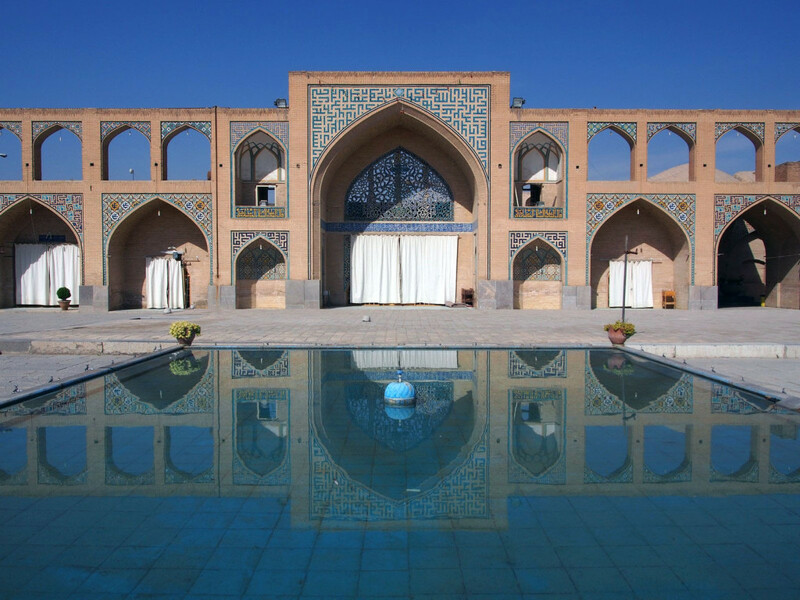 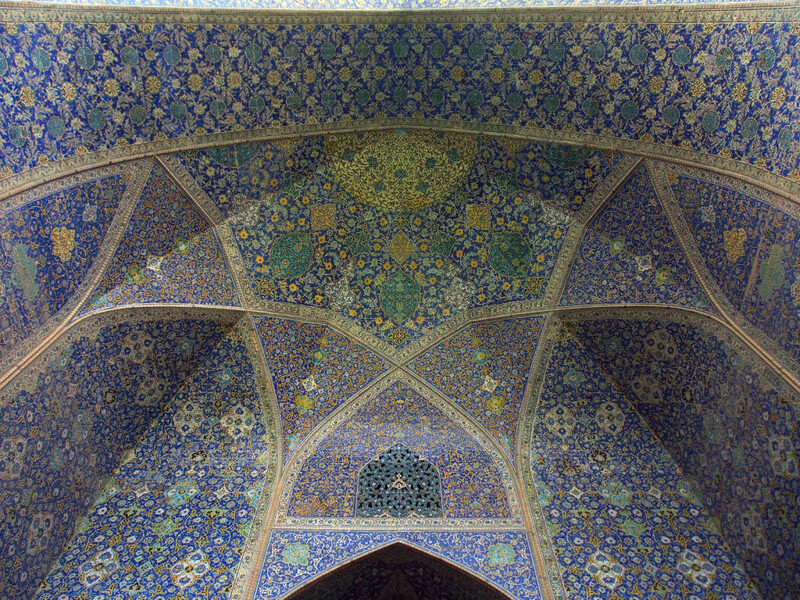 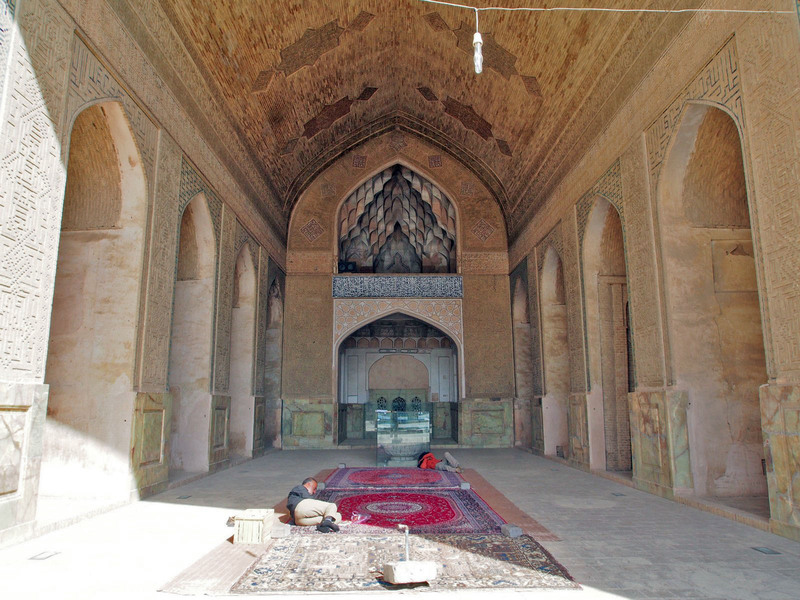 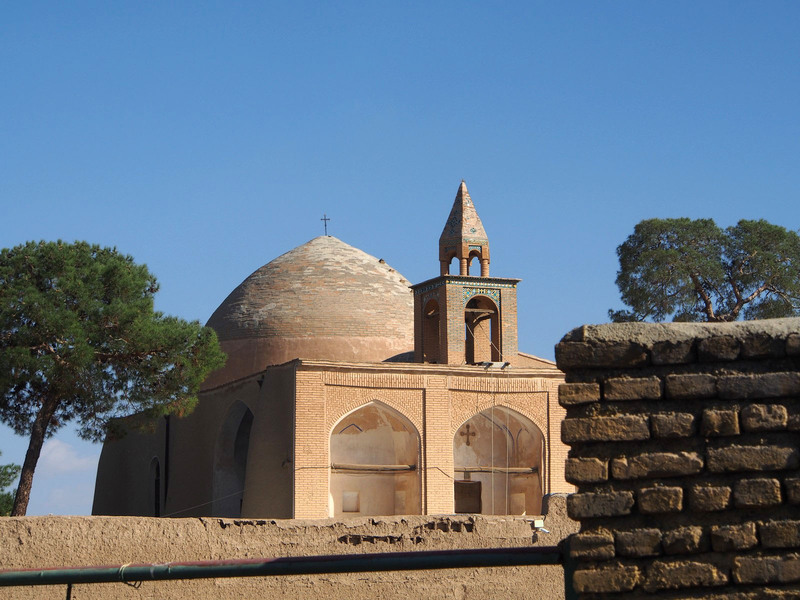 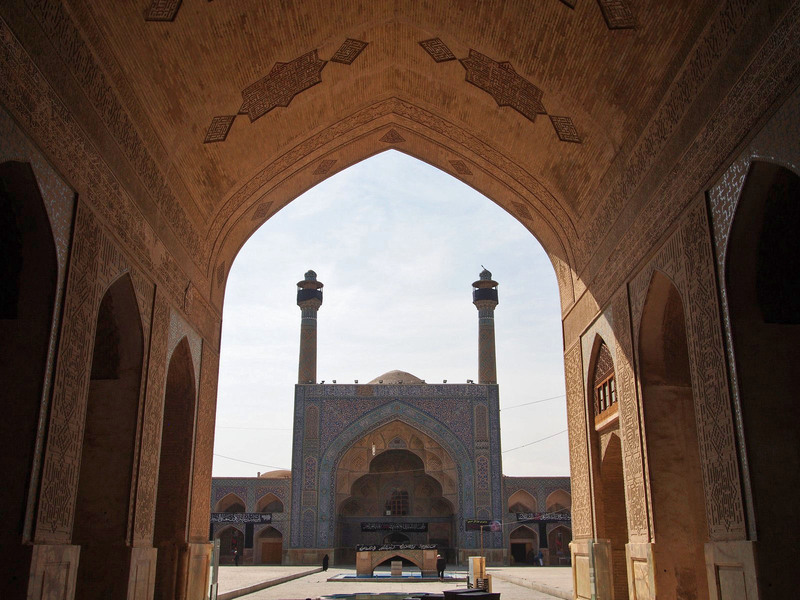 The Hakim mosque might be the oldest in town, but by far the largest is the Jameh Mosque – in fact it’s the largest in the whole of Iran at over 2000 square metres. 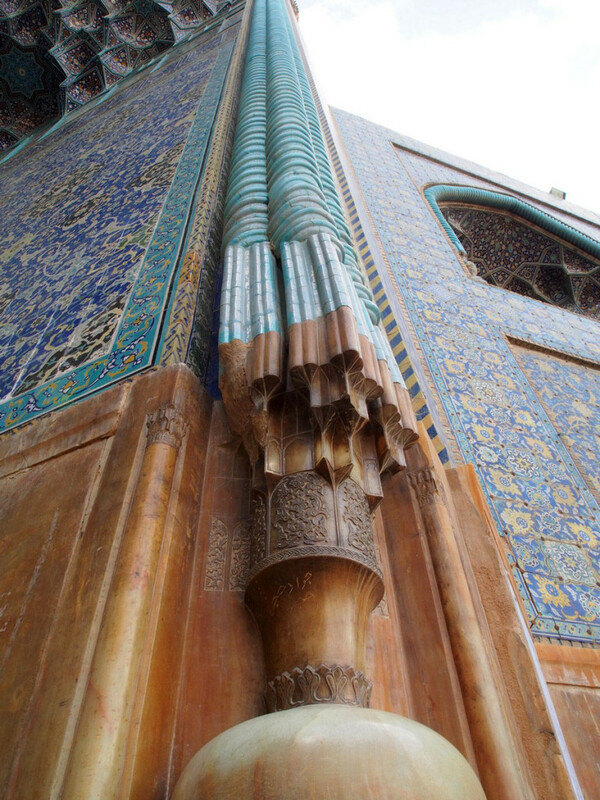 There’s a range of architectural styles and design details on display, as the mosque grew and evolved through the centuries. 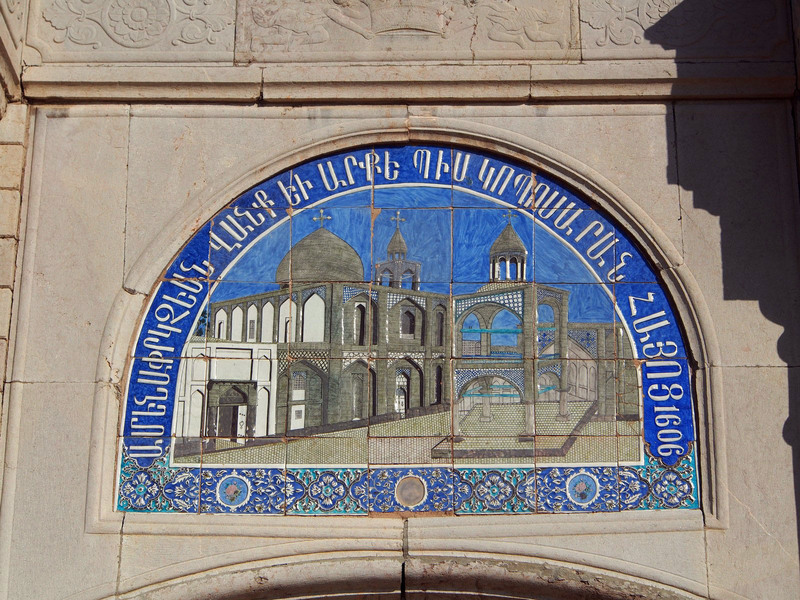 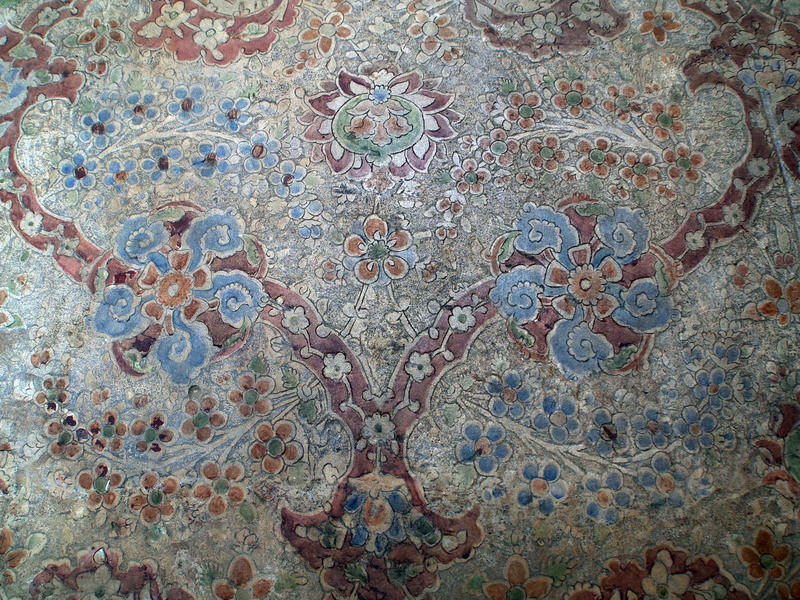 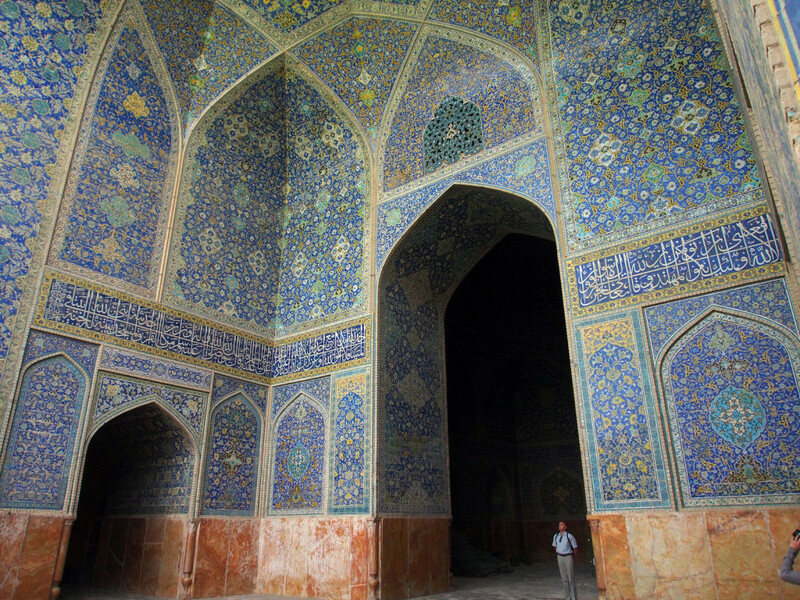 From the bare geometric brickwork of the Seljuks (11th C), through the Mongol (13th C) and Timurid (15th C) blue-tiled mosaics, to the more modern evolutions of the 17th and 18th Centuries. 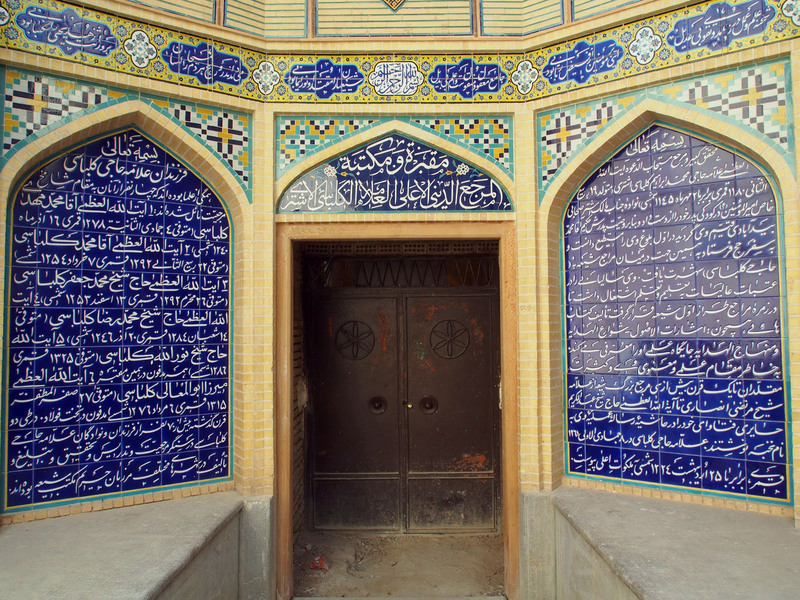 Wandering past another building, we heard a large crowd and peeked inside – finding an old mausoleum with another Muharram gathering. 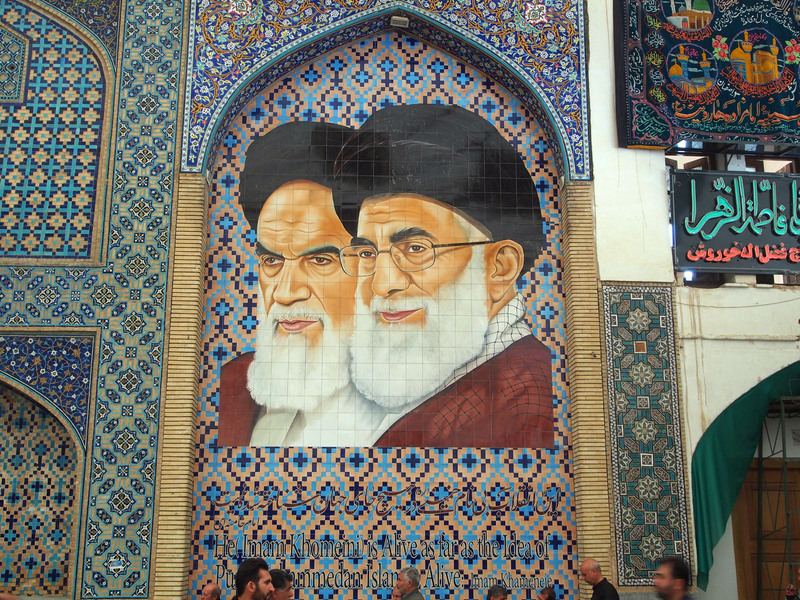 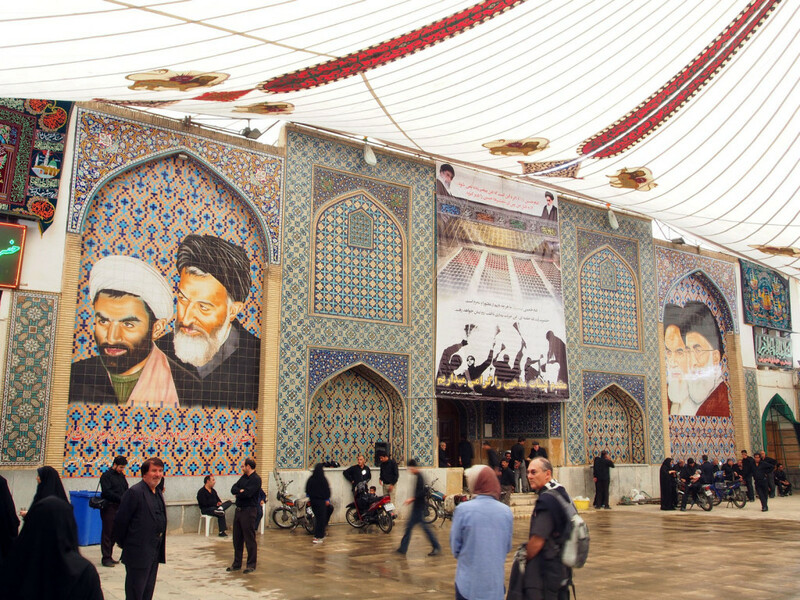 After being given tea and food by some of the helpers, we wandered around the tent-covered courtyard and admired the unusual painted murals of Ayatollahs and Presidents. 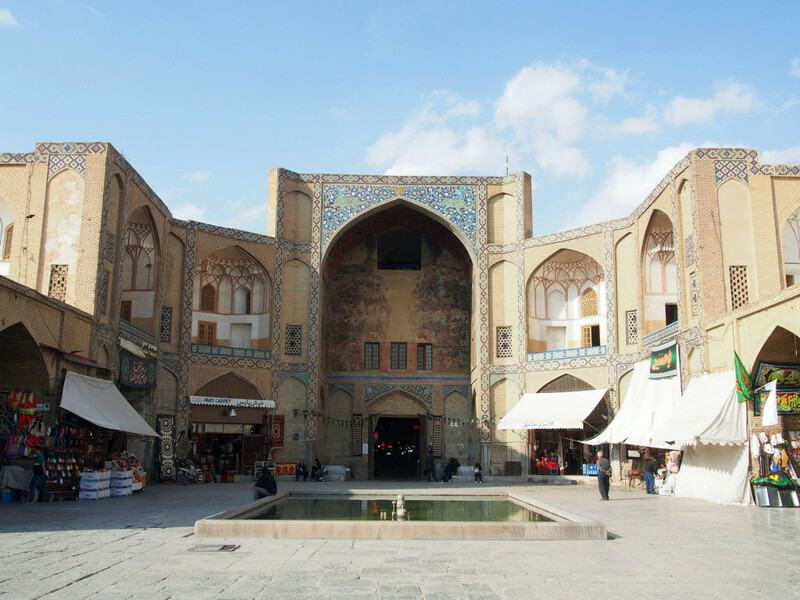 Eventually the twisting bazaars and laneways lead you to Imam Square, the heart of the city and one of the largest city squares in the world. 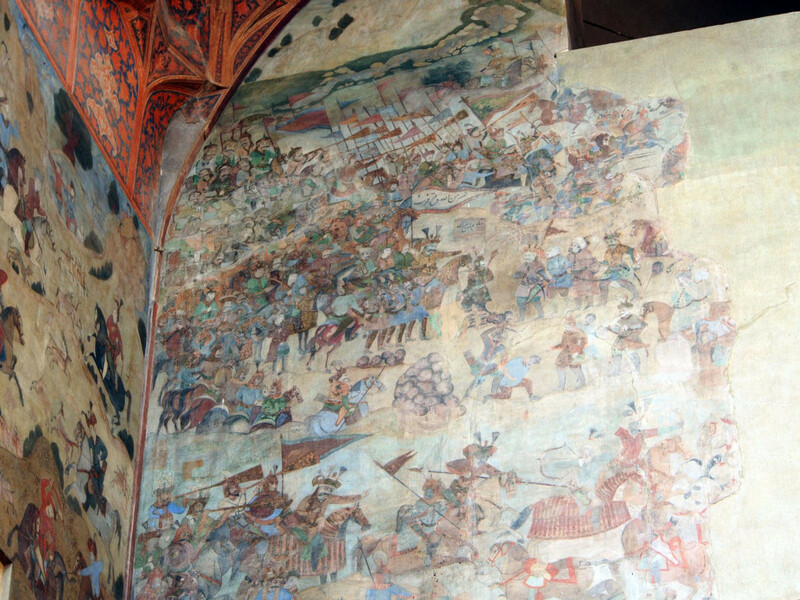 Coming from the bazaars to the north, you enter through the Qeysariah Portal, decorated with some very vivid frescoes of medieval battle. 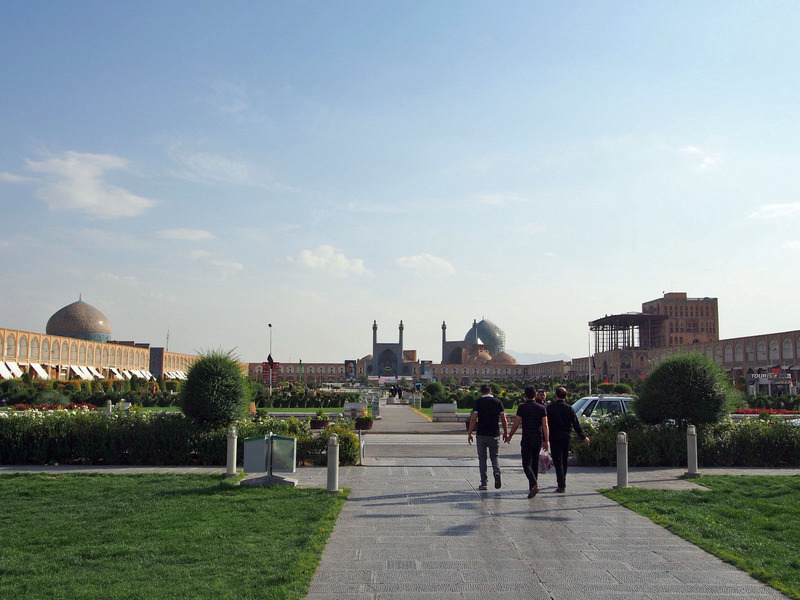 Imam square is a huge green space, filled with grass, shrubs, footpaths and fountains. 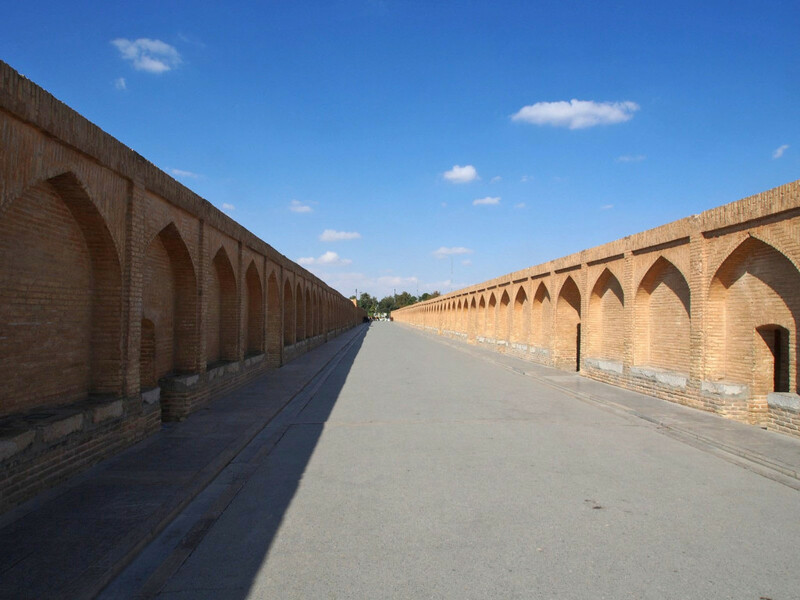 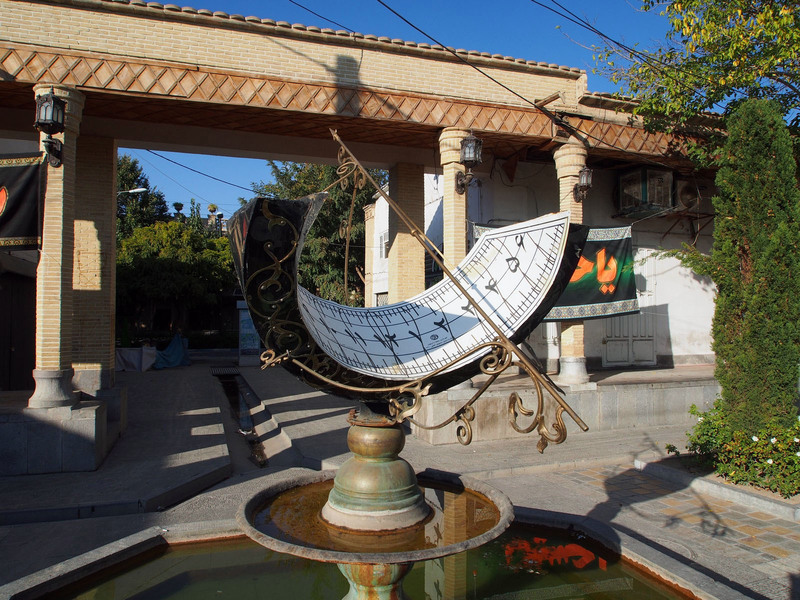 It’s lined with not just the two storey terrace containing shops, but a number of some of the most important monuments in Iran. 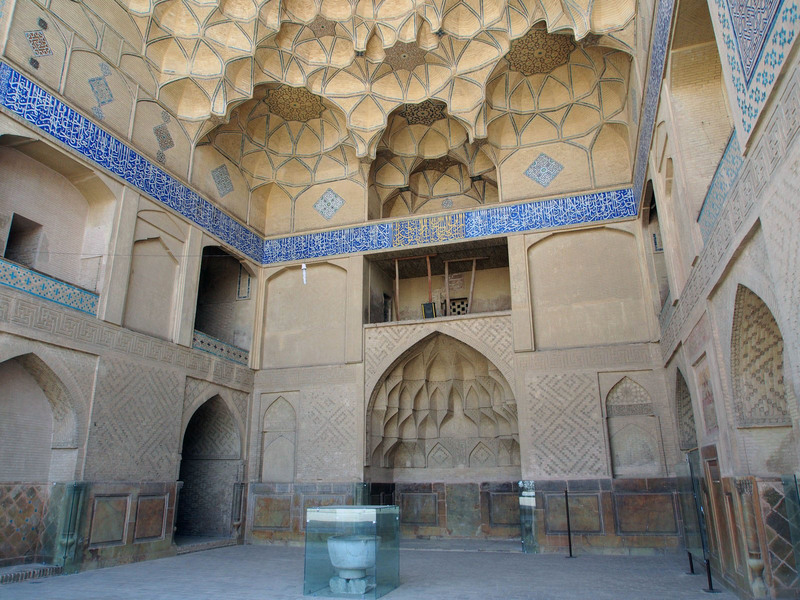 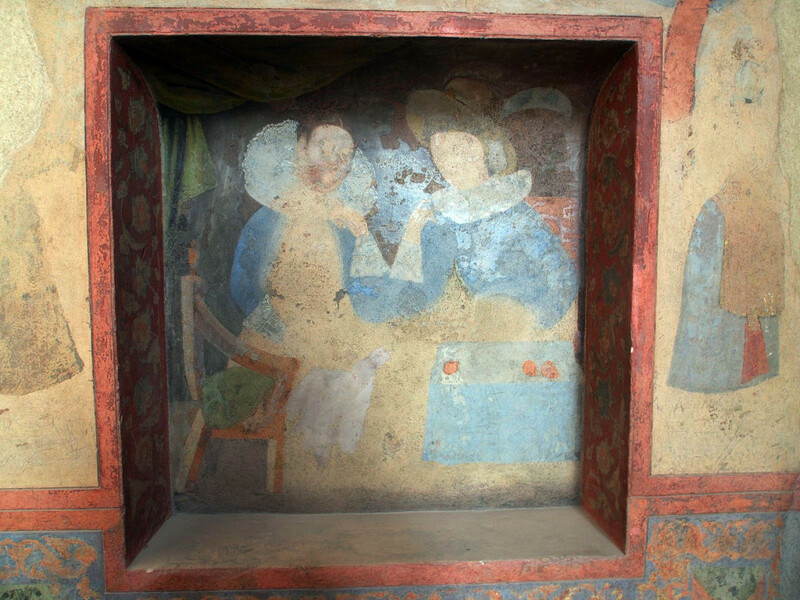 One of the key landmarks is the Ali Qapu Palace, the 16th Century residence of Shah Abbas I, the greatest of the Safavid dynasty. 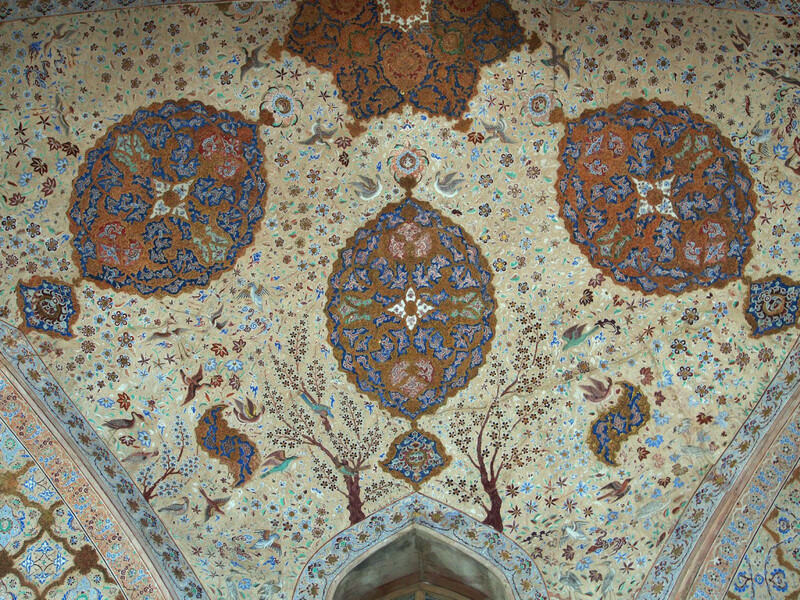 Looming six storeys tall, it’s richly decorated with mainly geometric patterns, although there are some European-style figurative images as well. 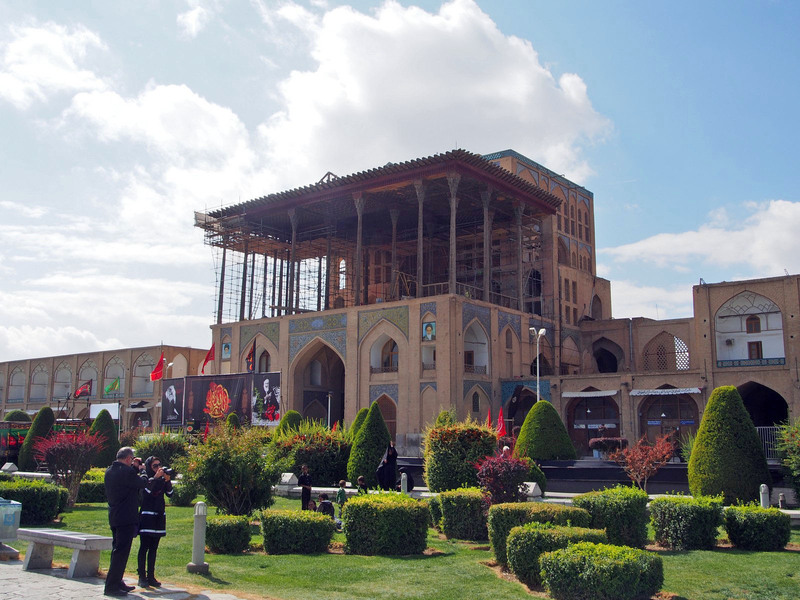 The view from the third floor balcony back over the square is gorgeous, although the effect is limited by the scaffolding in place to aid restoration. 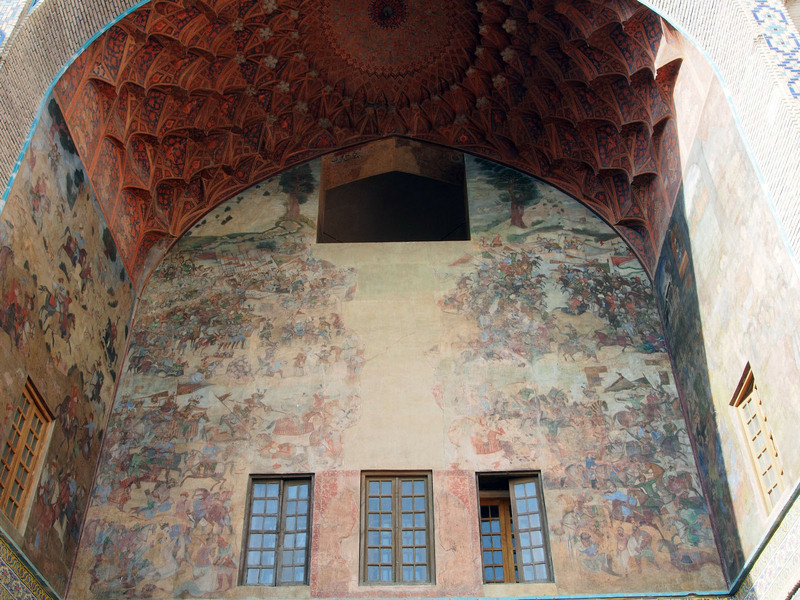 The most interesting part of the palace is the music room, where the ornate wooden panelling is sculpted with thousands of cut-out sections, to improve the acoustics. 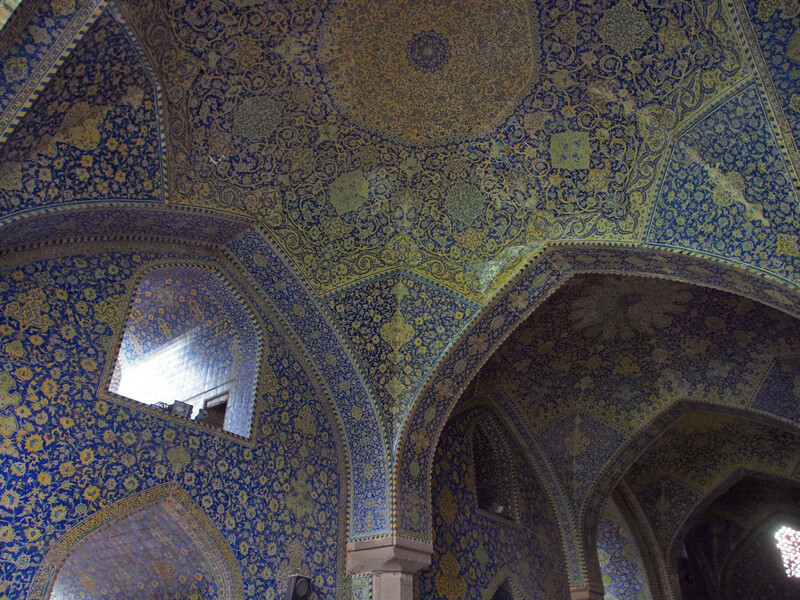 It’s as spectacular visually as it is aurally. 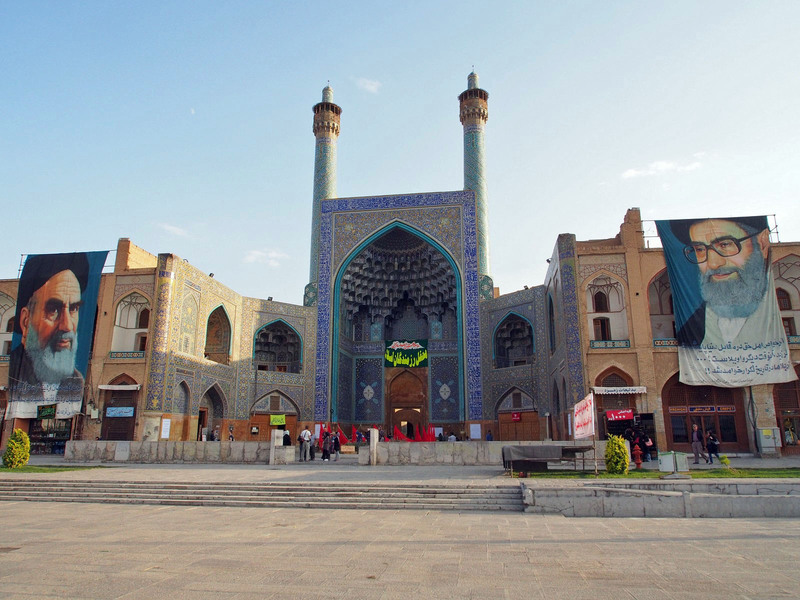 On the southern end of the square is the Imam Mosque. 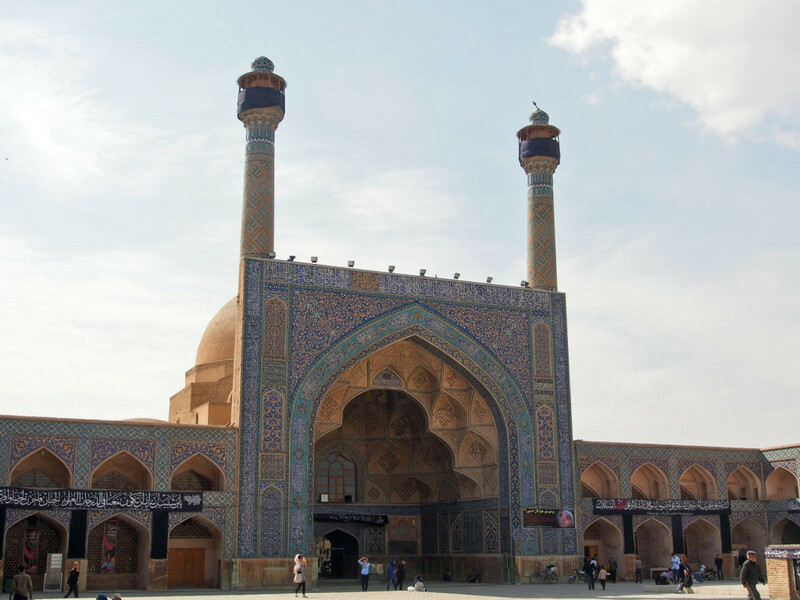 Although its portal faces the square, the mosque itself is orientated towards Mecca, meaning there’s a short angled passage between the two. 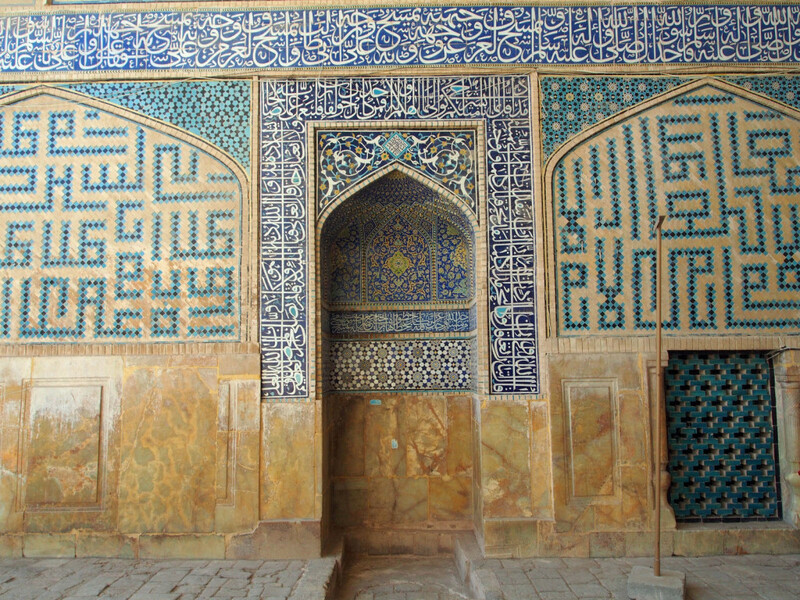 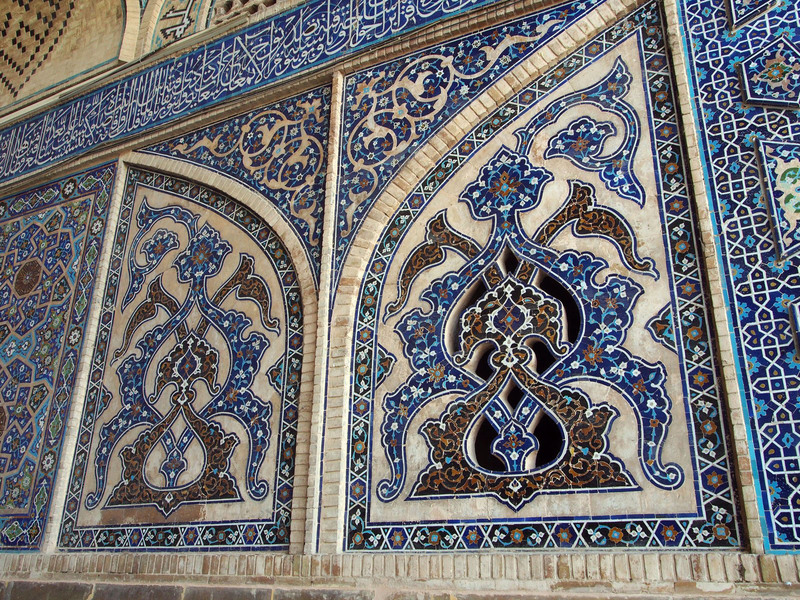 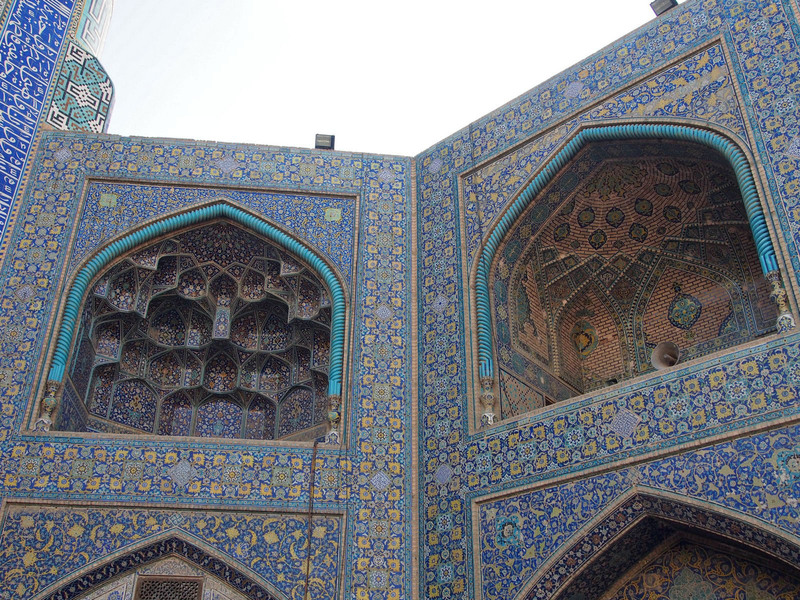 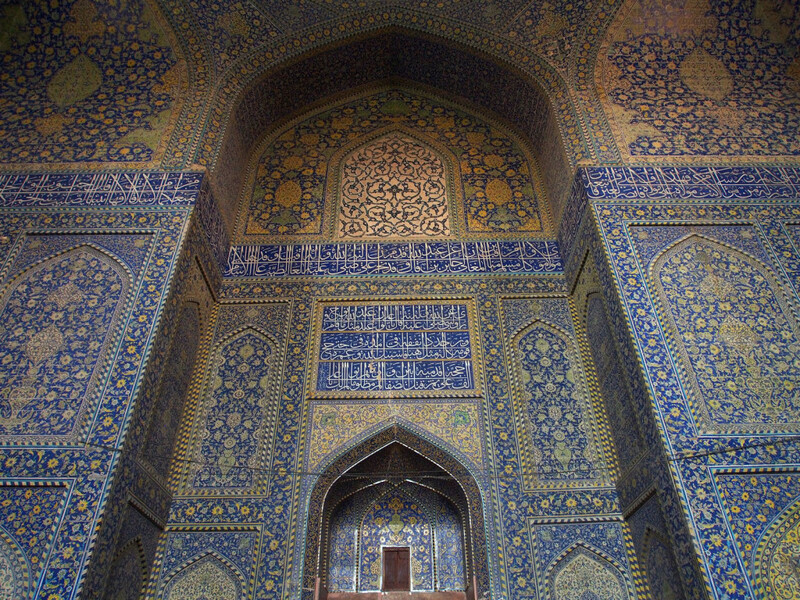 Even the portal itself is stunningly detailed, perhaps the best example of the ubiquitous blue-tiled Islamic architecture we’ve seen. 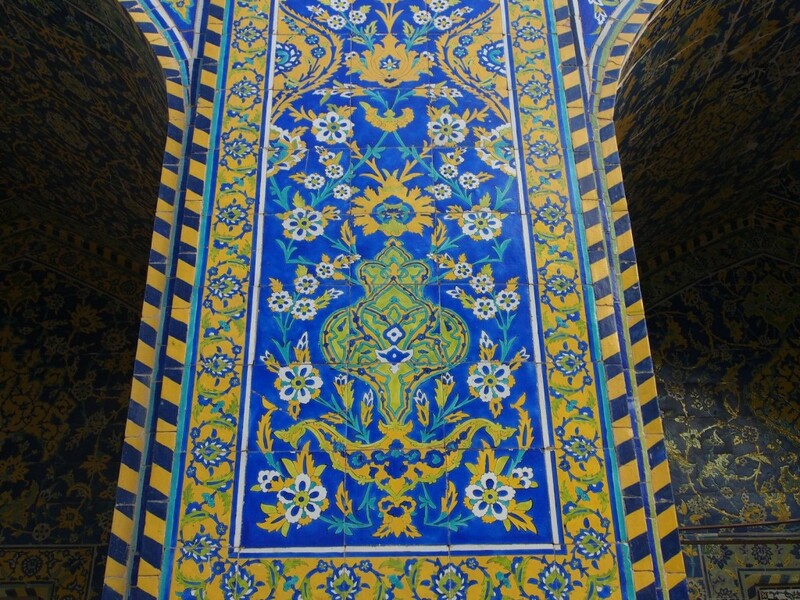 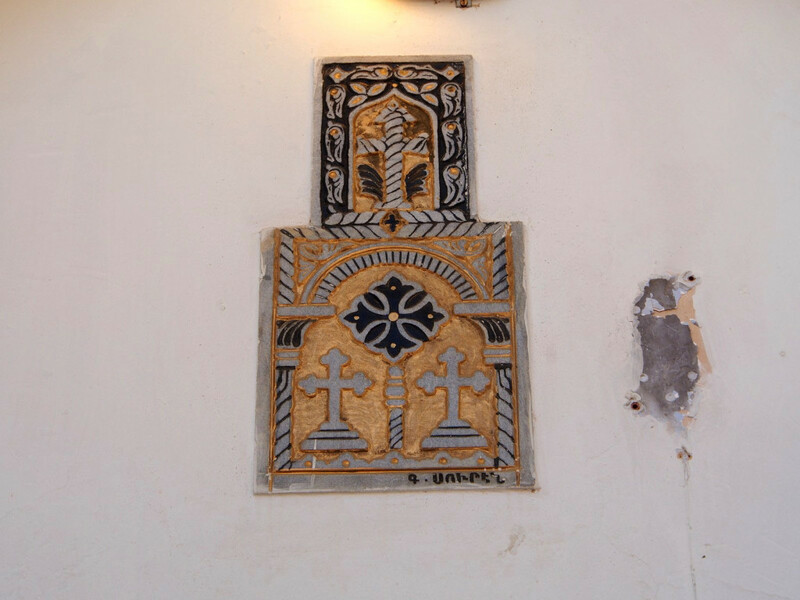 The mosaic tilework, with unusual highlights of green and yellow, spreads over every surface. 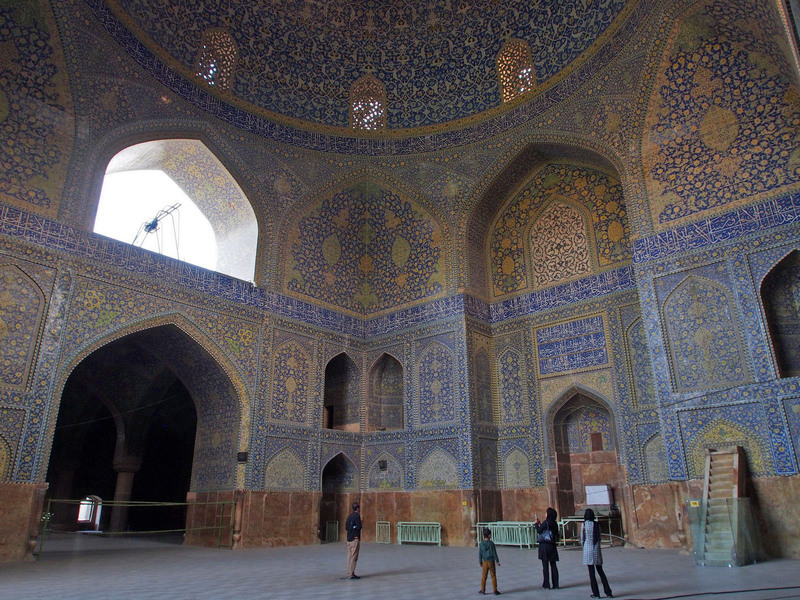 The highlight is the enormous domed central chamber. Right in the centre is a stone marking the perfect spot for acoustics. 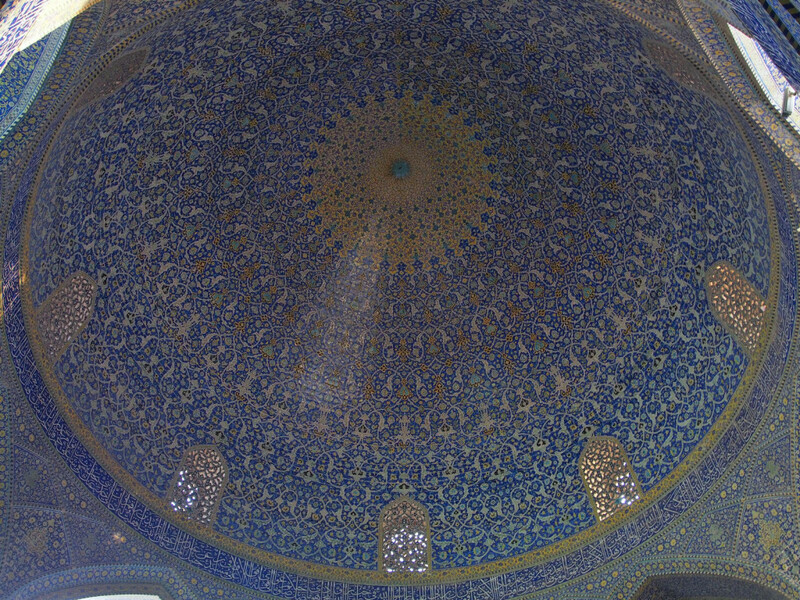 Usually used by the Imam to ensure the whole congregation can hear him, in the absence of everyone else I tested it with a quick rendition of “summertime” – the only song that came into my head. 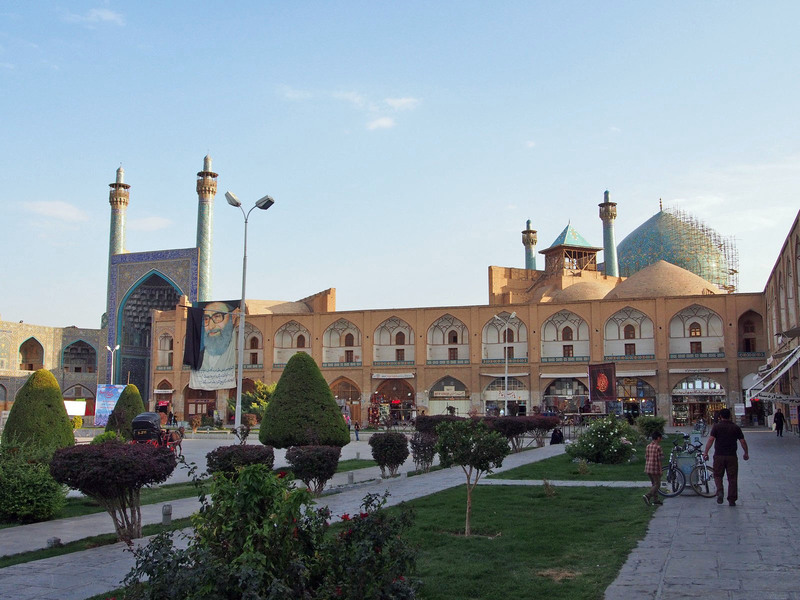 Further south of Imam square, the city is bisected by the Zayandeh River. 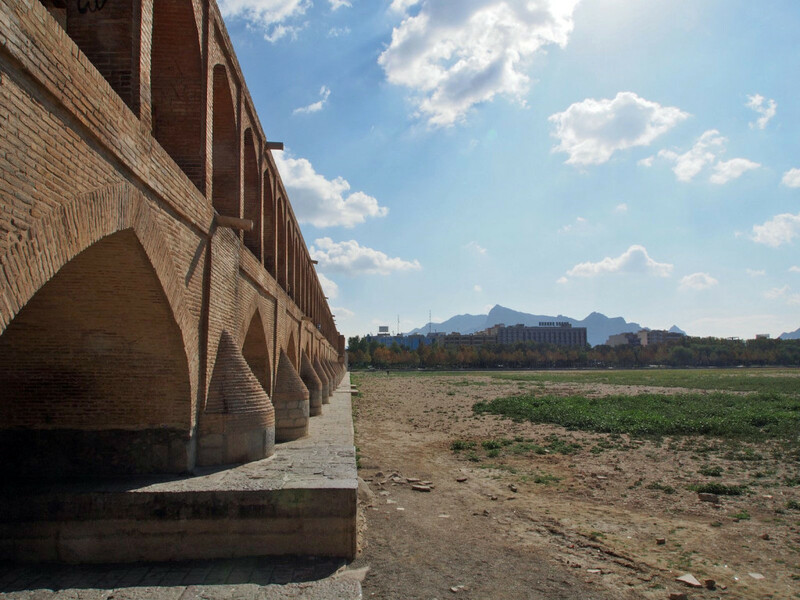 A number of historic bridges span the river, and make a lovely walking path to the south side. 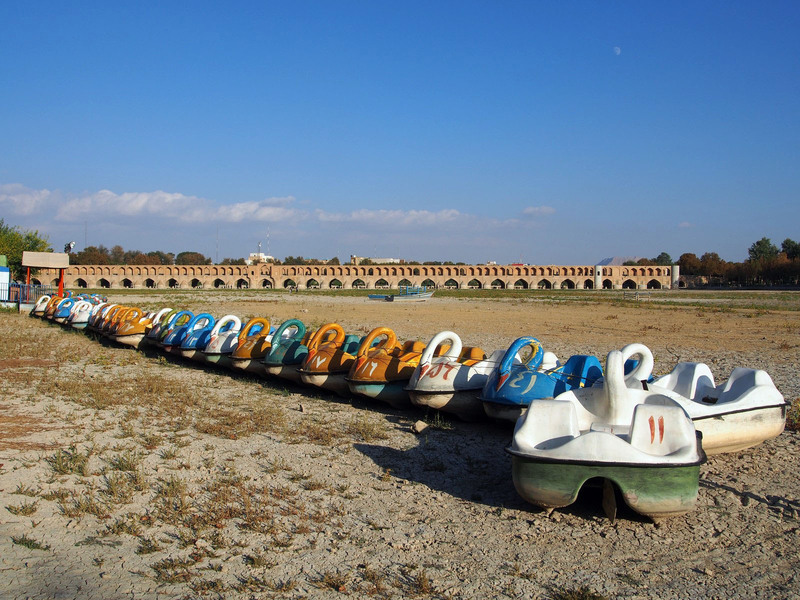 Unfortunately, the region is in drought at the moment, so the entire riverbed was dry. 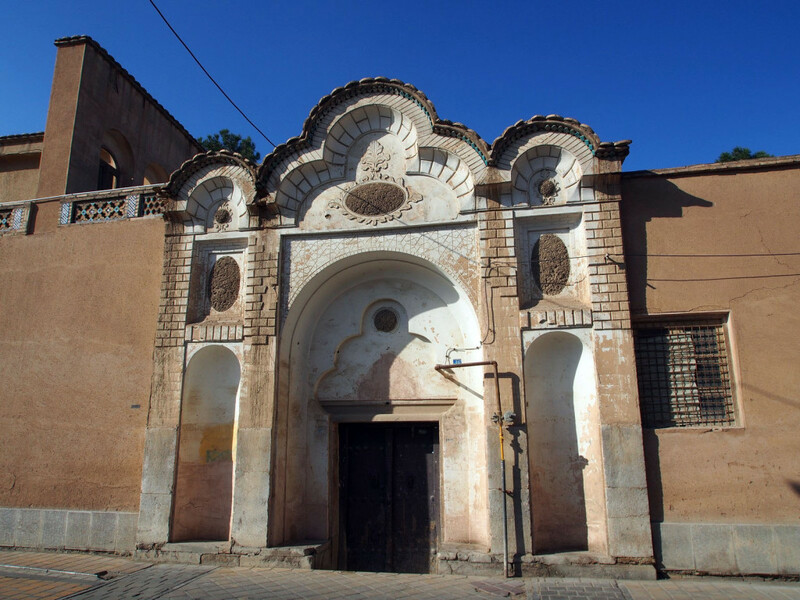 The most interesting part of the southern side of the city is the old Armenian quarter, with several historic churches – all closed to tourists due to the Muharram, unluckily for us. 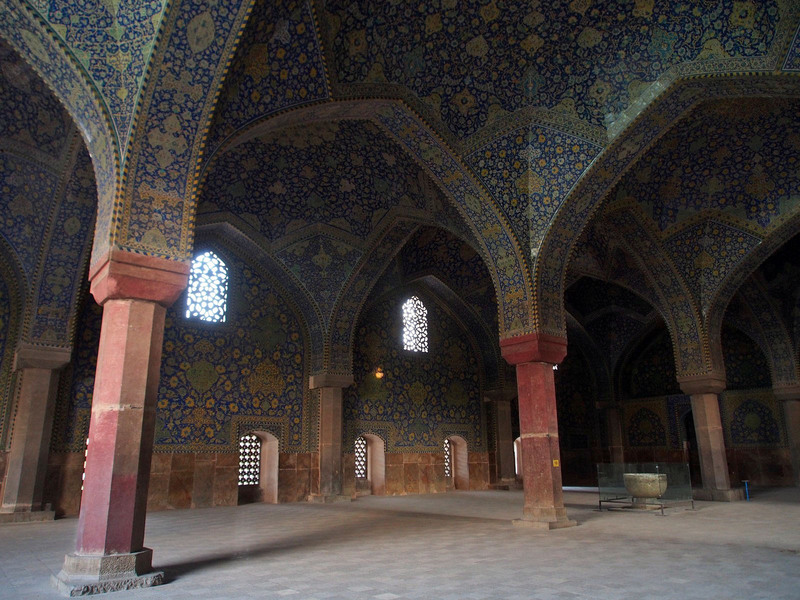 With our time in Isfahan finished, we rode out of the city north towards Tehran. 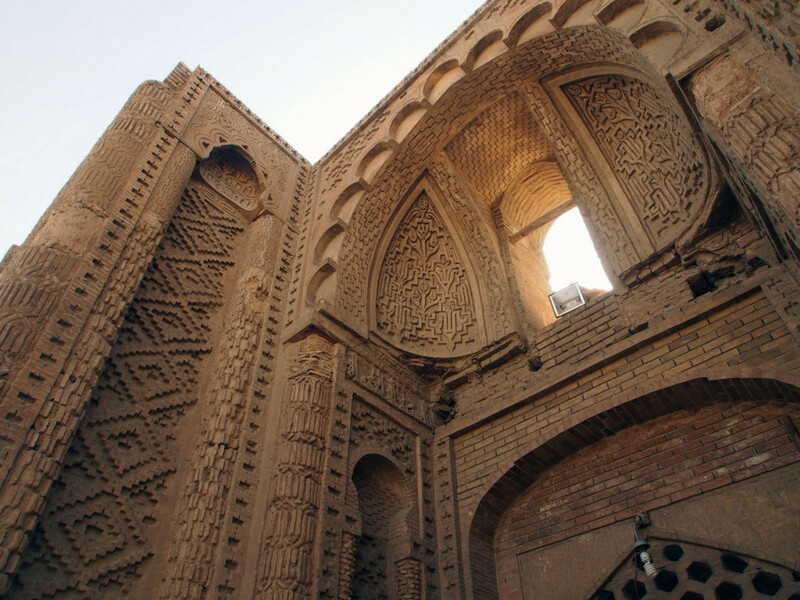 We stopped for lunch in the city of Kashan, known for its well preserved Qajar era (18th C) mansions, before camping in an old abandoned mud-brick castle. 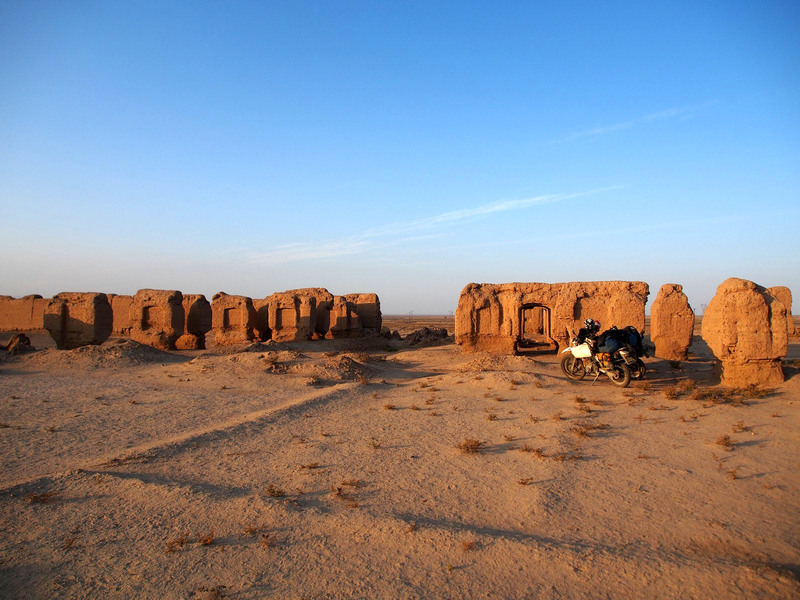 We have no idea how old it was or any aspect of its history, but it certainly made a stunningly atmospheric campsite.